In West Berlin in 1989, eighteen-year-old Ralf has just left school and is living a final golden summer with his three best friends. They spend their days swimming, smoking and daydreaming about the future, oblivious to the storm gathering on the other side of the Berlin Wall. But an unsettling discovery about his family and a meeting with the mysterious Oz shatters everything Ralf thought he knew about love and loyalty. 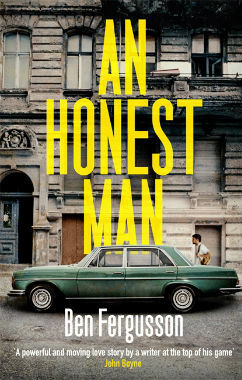 And as old Cold War tensions begin to tear his life apart, he finds himself caught up in a web of deceit, forced to make impossible choices about his country, his family and his heart. In 1902, Ingrid Hoffmann's family move her and her sister Margarete to a farm in German Southwest Africa that their father has bought from the aristocrat Baron von Ketz. In the face of casual racism, tensions with local tribes and the family's strange relationship with the von Ketzes, Ingrid worries increasingly for her sister's declining mental health in Africa, until a shocking murder forces the family back to Germany. Set in Berlin in 1946, The Spring of Kasper Meier follows the friendship that develops between Kasper Meier, a black-market trader, and Eva Hirsch, the young woman who is blackmailing him. As soldiers in Berlin begin to be killed in mysterious circumstances, both Kasper and Eva’s troubled pasts threaten to reveal themselves, and their fragile lives begin to spiral out of control. You can purchase in your local bookstore, or: buy online at Waterstones, Foyles, Hive, WHSmiths and Amazon, purchase the eBook for your Kindle, Nook, Kobo or Sony eReader, download the audiobook through Audible.